I borned in Firenze, i was surrounded more by Chianti than milk bottles. Wine is in our culture, in our cuisine, is our history. I still remember this man we met with my friends: A summer of several years ago, we were to a T bone steak Festival in the Maremma Toscana. We went to buy a bottle of wine and this old man described it with words like leather, red berries, i was amazed and i thought that man was a bit drunk already, but now, after so many years, i understand him. My mentor is my city, my tradition, the pairing with simple food, a great Chianti and good friends. Passion is the best foundations. Curiosity, never think to be arrive, to be complete, there is always something to learn, a wine to try, a pairing to attempt, a lesson to learn, a winery to visit. Be humble, too many “sommelier pin holder” that at the end of the day don’t know much about the whole wine world. Sommelier is a language and to learn a language you need practice and theory. You need books for the grammar, and degustation to practice that language. I ask what she/he having for meal and what she /he usually drink. I try to guide my customer to something to the next level of experience, something to remember. Currently i work with Riedle glass and of course every glass got his particular shape to enhance the characteristic of wine. Unfortunately i only have 3 types of wine glasses, for red, for white and for champagne. A good beginning is pair local food with local wine, it’s always the best to figure out the basis of the pairing: a Lambrusco and Tortellini, a Nero di Avola and tuna steak, a goat cheese and Sancerre. When you get familiar with it you can be more adventurous with food and wine from different Countries. Following the book, i should say yes, but always depends on the style of the restaurant, if it’s fine dining and the level of the wine we going to serve. Personally i don’t try the wine and i never seen a sommelier practice that. I guess that in future it will become more usual and common among sommeliers. All depends on the restaurant style, the food menu, the area where is located and the levels of your customers. An informal restaurant with many youngs has to keep an affordable level of wine prices, more promotions, more tips to somehow teach to this new generations the value and the world of the wine. I always create a mix of tradition, quality and some good unusual wine rising star. 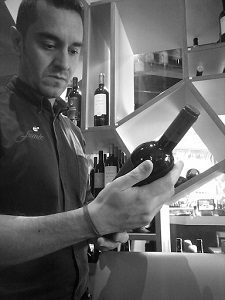 Sommelier before to be my job is my passion, only in this way you can stay updated, motivated and with a genuine desire to learn more, try, discuss, read, day by day. I like a winemaker which follow the entire process, from the grapes on the plants to the wine in the bottle. I like style, skills, informations. I pay more attention on the small producer, family owned but with a tradition, the expression of a land, the quality usually is there. Donàt follow the market follow your territory. Sangiovese of course. A wine who feel the terroir, but still maintain his own personality, its vibrant acidity, its complexity when is aged, its velvety tannin. Depends on my mood. Now I’m into Sicilian wine, like Faro Palari, Nerello Mascalese, but i also love some great red from Bolgheri area like “Campo alla Sughera” with a unique 100% Petit Verdot. I have to mention a great Cotes du Rhone, Guigal, with complex, bold, concentrated, lingering reds. Talking about white i need crispiness and minerality, i love a good Chablis or a magic and fresh Sancerre.